The Zawiya tribe wields considerable clout in modern Libya because of the vast size and strategic importance of its homeland in the old eastern province of Cyrenaica. From Ajadabia its members are spread out across vast interior regions around major oil deposits and water sources. They also command the trade, legal and illegal, that passes through the Kufra oasis archipelago and along the only tarmac road from thence to Jalo in the north. Desert traders and nomadic pastoralists the Zawiya conquered Kufra in 1840 subduing the indigenous Tebu which, at some time in antiquity, maintained a notable presence there. The remnants of their dwellings and forts are still visible. Since that time the Zawiya tribe has owned most of the date palm groves of the Kufra oases, employing the Tebu as labourers and extending its trading route into the Wadai, now part of Chad. It is said that Kufra under their rule was the most noted centre of brigandage in the Sahara. Plus ça change – plus c’est la même chose. The Zawiya leadership promised the Grand Senussi, Mohamed Ben Ali as-Senussi, a liberal donation of dates and water if he would establish a religious community there. This he did and the Senussi order eventually moved its headquarters to Kufra from whence it exercised its moral and temporal suasion and commercial competence over the hitherto predatory Zawiya, establishing a profitable trade in slaves and arms between the south and the north until the Italians drove it out in 1931. A minority of the inhabitants of modern Kufra are the descendents of the Senussi religious community known as the Ekwan who align themselves with the Zawiya. The Tebu have long been marginalised and since the fall of Gaddafi have acquired arms and become belligerent. Kufra is now a problem for the new Libyan government which has recently declared the south of Libya a military zone. Libya is a huge country. The very size of it alone would make it difficult to govern but the nature of the terrain adds immeasurably to the problem. The remoteness of Kufra, one of a number of oases deep in Libya, is profound. It is largely protected by the Ribiana Sand Sea to its north-west and the Kalansho Sand Sea to its north-east. The road from Benghazi, the old slave trade route, passes the oases of Tazerbo and Zighen and then the gap in the sand seas to Kufra proper. The dilution of traditional tribal ties, caused by urbanisation in the coastal towns of Benghazi and Ajadabia, has not occurred in the proudly isolated Kurfa. There, the hostility between the black Tebu people and the white Zawiya tribe has long been endemic. Recently it has escalated into open warfare, largely because Tebu migrants have flocked to Kufra from their homeland in the Tebesti mountain region of Chad. They are seen as inferiors and foreigners by the Zawiya majority who’s social, political and economic dominance they threaten. There are two other reasons why the Zawiya is important in Libya today. The first has to do with water. From 1,116 wells which tap into the ancient Nubian Sandstone Aquifer system below the Sahara a network of pre-stressed concrete pipes, known as the ‘Great Man Made River’, brings the pure ‘fossil’ water to the Libyan coastal cities of Tripoli, Misurata, Sirte and Benghazi for irrigation, industry and domestic use. Much of the water comes from the 126 wells in the Sarir field, 108 wells in the Tazerbo field and the 300 wells in the Kufra field, all in the homeland of the Zawiya tribe. The potential threat to the government of Libya should the Zawaya tribe sabotage the power supply to the wells and pumping stations is patiently obvious. The second reason for taking note of the Zawiya tribe is oil. The Sarir oilfield, which falls squarely within Zawaya tribal land, is one of the biggest in Libya and produces around 11% of its total output of crude oil. It flows through a 400 km pipeline to an oil terminal at Marsa Hariga near Tobruk on the Mediterranean coast of Libya. The Zawiya tribal leader, Sheik Faraj al Zwai, has been known to threaten to interrupt oil exports from the Sarir field and some believe he may have threatened the other major Arabian Gulf Company fields of Messla and Nafoora-Aquila. 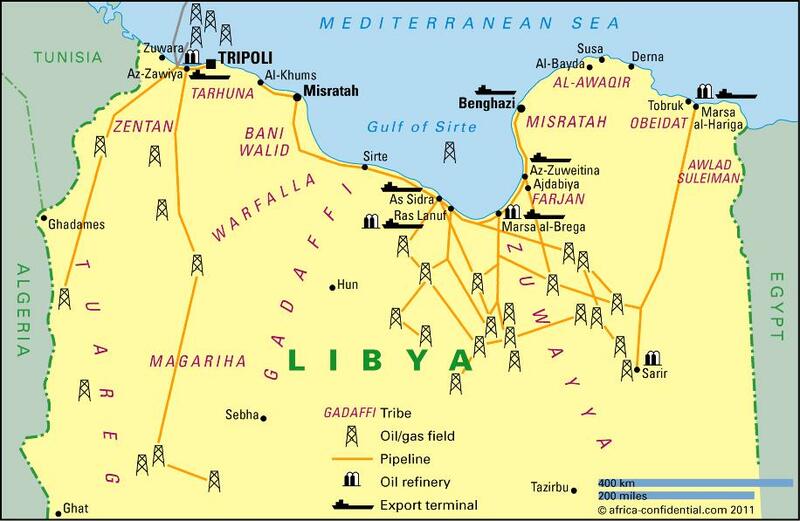 Taken together the capacity of these three fields is believed to amount to over 1 million barrels per day or around two thirds of Libya’s output. At the time of writing sectarian violence has broken out yet again in Belfast, a part of the United Kingdom. The lesson is that tribal values that are seen as anachronistic are still unresolved in Belfast, as they are in Kufra. A few words about the Zawiya might be helpful. Its tribal homeland coincides in the northwest with that of the al Magharba tribe which occupies a swath of the shore and hinterland of the Gulf of Sidra, including some of the important oil ports such as Marsa Brega. The Magharba also has holdings in the oasis town of Jalo which it shares with the Awajila tribe and the Zawiya. The al Magharba is one of nine Sa’adi tribes of Eastern Libya which trace their ancestry to the true Arab Bedouin tribes from the Nejd which migrated belligerently into Libya in 1050, pushing the indigenous Berbers into the Jebel Nefusa. The Sa’adi tribes, therefore, own their homeland by right of conquest. Their people are ‘Hurr’ or free. The Zawiay’s neighbours to the north east are the Fawaqiur, a landlocked client tribe with ties to the Awaqiur tribe around Benghazi. Like the Zawiya the Fawaqiur is a client tribe or ‘Marabtin al sadqan’. Theoretically both these tribes occupy their homeland in return for ‘sadaqa’. Sadaqa is a fee payable to a free tribe for using its earth and water and for its protection. In effect the Zawiya no longer pay the fee but the relationship between it and the Magharba still retains remnants of class distinction. The Libyan civil war left the Sothern borders with Egypt, Darfur and Chad undefended. Arms from Gaddafi’s looted armoires have been smuggled across the boarder and have done much to destabilise regimes in the Sahel. The new Libyan government has declared Sothern Libya a military zone and intends to restore a semblance of order there. Its relations with the Zawiya will be of some importance. The trial of a member of the Zawiya tribe has recently commenced in Tripoli and will be worthy of attention in the future.